Leith Festival is all about the community of Leith. 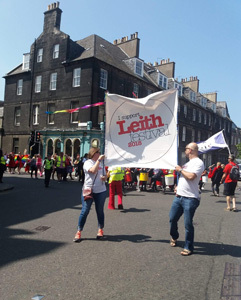 We have eight days of events from 8th to the 16th June 2019, organised for the people of Leith by the people of Leith. It gives the opportunity for professional and amateur groups alike to be involved in theatre, music, arts, history, song, in fact pretty much anything within their local community. Our full programme will be announced early May, in the meantime you can also check our Facebook Events listings. If you have any questions please email us on office@leithfestival.com and we will get back to you as soon as possible. Signup to our newsletter and stay up-to-date with upcoming events and news. Your details are private and safe with us! © 2019 Leith Festival. Scottish Charity Number: SC036496 Website by	In Motion Designs.